The worst mass shooting to ever take place on American soil happened overnight in Las Vegas, as I’m sure you’re aware of. With the world still trying to process it and understand how yet another disgusting shooting has taken place, I’ve seen many incorrectly frame this as an act of terrorism. From Twitter users, to international stars like Rihanna, many are falsely trying to claim that this as an act of terrorism, when by definition it’s not. I am by no means trying to underestimate the gravity of the situation, I’m not making any excuses for what happened, there are absolutely none, but the danger here is that a lazy attitude to reacting to this situation is going to drive a wedge even further between ethnic communities and races in America and potentially around the world. It’s this same laziness and knee jerk reactions that led hundreds of people online to falsely identify the wrong person as the perpetrator and even led Google to having that false information wind up at the top of their search rankings. People are claiming this is “white terrorism” and that because the horrible crime was committed by a white person, the media are evoking their white privilege and choosing to mislead the public. America and indeed the world, needs less race baiting, more unity and an ability to think clearly, even in horrifically violent and traumatising situations like we are seeing in Las Vegas. Debating gun laws might be a better place to start, rather than arguing over the colour of the skin of the deranged person who committed this vicious crime. How do you define an ‘Act of Terrorism’? The first definition above from Google gives us an idea. The Merriam-Webster definition also states that terrorism is “the systemic use of terror as a means of coercion”. These are important to keep in mind. Terrorism is a persistent use of violence to force society to adopt your views, be they political or religious. Motive is important. Ideology is also important. For example, ISIS have a clear agenda and political aim, to destroy the West and enforce the Islamic State around the world. Their attacks are politically motived and they use violence against civilians repeatedly to try and achieve their goals. They engage in acts of terrorism. It has nothing to do with their skin colour, it has to do with their reasoning and their persistent campaigns of violence to try and force people into their view of the world. 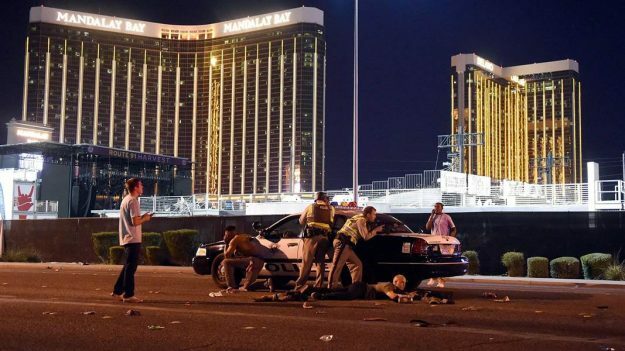 So, if we drop skin colour and race from the equation and just focus on what happened in Las Vegas, what we currently know is that there are no obvious connections to extremist groups, according to officials. A man armed himself with several machine guns and opened fire on a crowd of people attending a country music concert form the 32nd floor of a hotel, then killed himself. This was a horrific single event where, as of writing, 58 people have been brutally murdered. Why? We currently don’t know. And as I said, if this turns out to be that the shooter was trying to push an extreme political ideology, or has ties to radicalist groups, then yes, it’s an act of terrorism. However, currently, the latest reports claim that “Investigators have found no link to international terrorism, despite a claim from so-called Islamic State.”. A man killed 58 innocent people from all walks of life. Mass Shootings are getting progressively worse and are being enabled by a readily available arsenal of weapons that can be purchased far too easily. From an outsiders perspective, that seems to be a more important issue to focus on, rather than dividing communities even further apart. Australia took steps in the past to prevent these kinds of crimes, maybe look to them for inspiration.